WICKER PARK — Music lovers rejoice: The independent record store chain Reckless Records is moving into a 100-year-old vintage building in Wicker Park and aims to create what its founder is calling "a kind of Reckless Megastore." Charles Taylor, chief executive officer of Reckless Records, purchased a two-story brick building at 1379 N. Milwaukee Ave. for $1,580,000 on Dec. 30, according to CoStar, a real estate data company. "Big chain record stores are obviously a thing of the past, with fewer people paying for music. But independent stores can survive by providing a service for people who are crazy about music and value the superior sound and presentation of LPs," Taylor said in an email to DNAinfo Chicago. 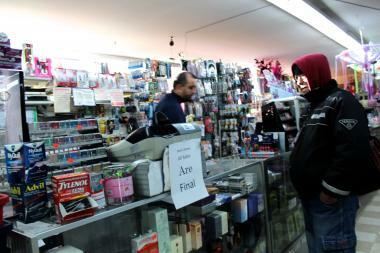 Dollar Buster at 1379 N. Milwaukee Ave. in Wicker Park is closing. About two blocks south of Reckless Records' existing storefront at 1532 N. Milwaukee Ave., the building, constructed in 1913, was previously home to Aronson Furniture, which sold appliances and home stereo systems. Taylor said the the size of the building and location were the main attractions for the shop, which will initially just be for selling LPs, CDs and DVDs, though there will be plenty of in-store performances. "They'll be easier to organize with the extra space," Taylor said of the in-store performances. Faded signs advertising name brands like Hitachi and Electrophonic have remained on the building's facade. An ad from 1971 advertises an Electrophonic "nine-piece total music system with 8-track stereo" for sale at Aronson for $169.95. Mark Kishtow, senior vice president of Jameson Real Estate, which sold the building to Taylor, said Reckless Records was planning to use the vintage ads, including a marquee sign which they "loved from day one." Founded in 1982, the independently owned record store chain has operated in Chicago since 1988 and has shops in Wicker Park, Lakeview and Downtown. Bryan Smith, general manager of Reckless Records' Chicago stores, said "we're excited." Though the plan is to relocate the store down the block, Smith said it's "still up in the air on timeline and how soon we will give up this [existing] space." Taylor also could not elaborate on the precise plans but said, "One thing I'm sure of: It will be the most amazing record store in Chicago!" Smith said there is at least one year remaining on Reckless Records' current lease. Last February, Joseph Dushey from New York City-based Jenel Management added several Wicker Park buildings to his portfolio, including the building where Wicker Park's Reckless Records resides. "Landlords closer to the North/Milwaukee intersection are now looking to rent to the larger chains, which means that the area will become less interesting and as you go further south it will become more interesting," Taylor said. Reckless Records opened in Wicker Park in 1994. 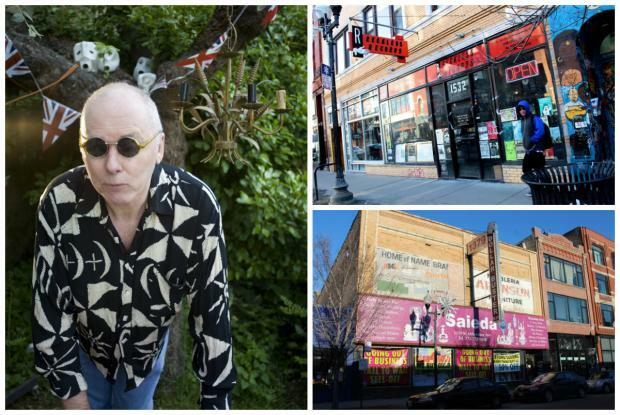 "We are happy that [Reckless is] staying in the neighborhood. This will be a great fit for them. Their current space is much smaller," Kishtow said. Including its basement, the building offers 15,000 square feet of retail space over three levels, and Reckless Records is not planning to divide it, Taylor confirmed. Meanwhile, Dollar Buster, a general merchandise store currently at 1379 N. Milwaukee Ave., is advertising a going-out-of-business sale and plans to close "in mid-March or sooner," a worker said. Signs in the window of Dollar Buster promote a "Wall-to-Wall Sell Off" and "Everything must go." Dollar Buster sells kitchen, bath and party supplies, as well as items for baby showers and birthdays. About half of the merchandise is 50 percent off, and there's furniture for sale in the basement, too. Dollar Buster, 1379 N. Milwaukee Ave. Hours are 10 a.m. to 7 p.m. daily. Phone: 773-772-1818.